You may have a saving strategy in place for higher education, but do you have a plan for spending that money once those bills start rolling in? The spending decisions you and your student make can affect your broader financial situation, such as financial aid eligibility and tax costs and how much you're able to save for other goals like retirement. You can learn about the best practices for developing an efficient college spending strategy in Vanguard's research paper Tackling the tuition bill: Managing higher education expenses. Uniform Gifts/Transfers to Minors Act (UGMA/UTMA) accounts. Contributions from grandparents or other family members. How you decide to spend from your various resources can affect your student's eligibility for financial aid and the amount he or she is able to receive. Beginning with the 2017–2018 school year, the Free Application for Federal Student Aid (FAFSA) now requires applicants to report income information from two years ago. To maximize your student's chance of getting the most aid, consider spending his or her assets first (in the early college years). This might include money from the student's taxable savings and investment accounts or a trust account for which he or she is an owner or beneficiary. By delaying spending from sources that are considered student income, like distributions from a grandparent's 529 account, you may be able to boost the amount of aid your student is eligible for in later years. While you're looking for ways to increase financial aid, you'll also want to decrease taxes. It's important to determine which higher-education expenses qualify for tax-free withdrawals from your 529 account and which can be applied toward tax credits or deductions. At the federal level, you can use only one education credit or deduction per student in a given tax year. If you qualify, the American Opportunity Tax Credit (AOTC), which provides a credit of up to $2,500 on $4,000 of qualified spending, is generally the most beneficial. Otherwise, depending on your situation, you may be able to apply for the Lifetime Learning Credit (LLC) or the tuition and fees deduction. Most tax credits and deductions for educational spending are meant to benefit lower- and middle-income families. For example, to claim the AOTC, your modified adjusted gross income for 2017 must be $80,000 or less ($160,000 or less for married taxpayers filing jointly). For families with higher incomes, the tax impacts of spending from various account types can be even more significant. If they spend from tax-deferred accounts, they could increase the income that's taxed at ordinary rates. While spending from taxable accounts could mean they'd realize gains that would be subject to capital gains rates and losses that could count toward deductions. It may seem logical to tap your 529 account first when paying tuition and other sizable education expenses. However, if you follow a more flexible approach and spend more regularly from your 529 throughout the student's college years, you'll be able to make the most of the benefits these plans offer, including tax-deferred growth on earnings. By relying more on 529 assets, you can depend less on other financial resources, such as loans or out-of-pocket spending, in any given year. And, as long as you're contributing to your 529 account, you'll be able to continue taking advantage of other tax savings, for example, deductions on your state income tax return. 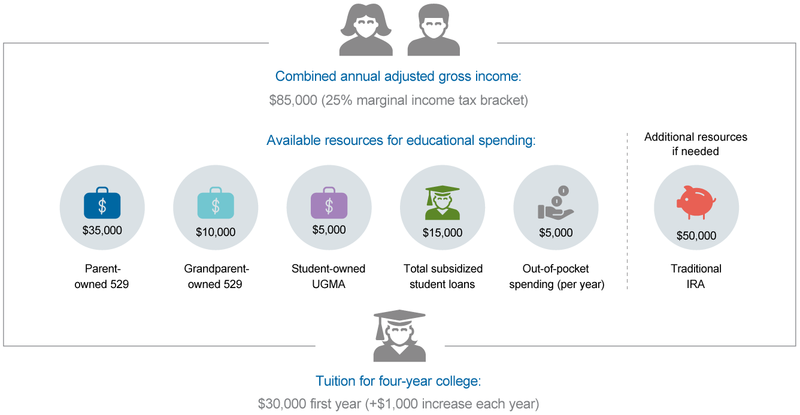 Know which higher-education expenses are considered qualified, such as tuition, fees, books, computers, and room and board. Avoid penalties by withdrawing money in the calendar year that you plan to use it. A common mistake is withdrawing money in the fall for the entire school year. This creates a gap between the withdrawal year and the year in which some of the bills are due. When paying expenses for the spring semester, for example, wait until after January 1 to make a withdrawal. Keep good records of your 529 withdrawals so you don't exceed your qualified expenses. You don't want to end up paying taxes—and possibly penalties—on extra withdrawals. Spending from other available accounts, but be aware of any possible tax consequences. Taking advantage of federal student loans, if your student is eligible. The Vanguard Tackling the tuition bill research paper illustrates strategic college spending through a few scenarios that show how a hypothetical family's spending decisions can increase financial aid and decrease tax bills by several thousand dollars. This study details two possible scenarios for how this family could spend from their assets. The first scenario prioritizes delaying out-of-pocket spending and disregards the possible impacts to taxes and financial aid that such spending may have. The second scenario follows a strategy aligned to the best practices detailed in the paper. 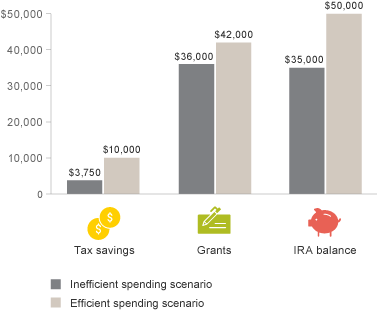 $6,250 in potential taxes saved by not tapping into their traditional IRA. $6,000 more in estimated financial aid by spending the student-owned UGMA account early and delaying spending from the grandparent-owned 529. $15,000 added to their retirement savings. Although your resources may differ from those in this case study, the important thing to remember is that no matter where you're pulling money from, you want to spend it in a way that enables you to take advantage of financial aid as well as any tax benefits. Smart college spending will allow you to meet the challenges of paying for higher-education expenses without going over your budget or jeopardizing other financial goals, for example saving for retirement. Source: Jonathan R. Kahler, Jenna L. McNamee, and Maria A. Bruno, 2016. Tackling the tuition bill: Managing higher education expenses. Valley Forge, Pa.: The Vanguard Group.